Gbanga created the multiplayer VR puzzle game «SLX» for the 9th Swiss Lawyer Congress in the KKL Lucerne, for Swisslex, the leading legal database of Switzerland, in cooperation with Roth&Maerchy. The game design is based on the abstract expression “Schulterschluss” (German for collaboration, solidarity, closing of ranks, to stand shoulder-to-shoulder with somebody). Therefore, the VR game SLX Arena encourages the cooperation of three player roles, represented as the three pillars in law: advocacy, judiciary and prosecution. The visual representation of the level is based on the shape of Swisslex’s logo. In the circular design players have to work together to get an avatar from the outside to the middle. 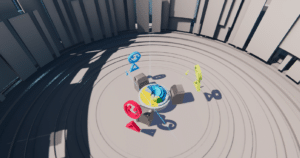 One player can move the avatar from tile to tile, another player can move blocks up and down to free the way and the third player can rotate the rings of the level to create new connections. 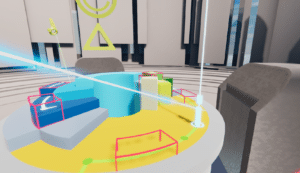 Interaction with the level is done in a minimal way, as for most players it was probably their first experience with VR technology. 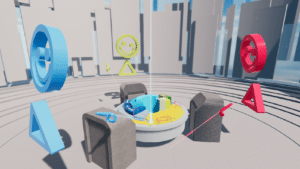 Players use the vive headset and only one controller, the entire game can be played standing still and doesn’t require movement of the players which reduces motion sickness and reduces new players’ fear of walking into something. On the annual Swiss Lawyer Congress in the KKL Lucerne the game could be played for two days. The reception was overwhelmingly positive with players praising the feeling of teamwork they got while playing the game and the joy of solving the puzzle together. Multiplayer experiences in games is a proven concept. However, only few games make us of it in virtual reality games. SLX Arena is one of the rare games where several players play in a collaborative way which requires a technically sophisticated low-latency infrastructure and efficient network handling by the game software. Gbanga used the UNET Low Level Networking API combined with internally developed software parts.